Jefferson was a pioneer in the principles and methods of modern archaeology. 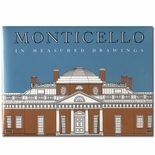 The excavations outlined in this book reveal a great deal about Jefferson, the African-American community on Mulberry Row and the development of Monticello's landscape. By William M. Kelso, Director of Archaeology at Monticello from 1979 to 1993, with foreword by University of Virginia professor James Deetz. Softbound, 134 pages.